Michelle Schaffner is a registered nurse (RN) who recently underwent a knee replacement procedure at Beebe Healthcare. Michelle’s professional journey is impressive. 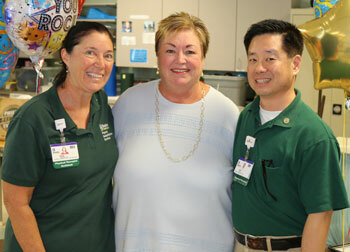 She has worked in healthcare for 41 years and her first 25 years were spent at the patient’s bedside. Michelle’s knee replacement experience began in her physician’s office and her Beebe experience started well before she stepped into the hospital. Beebe Healthcare’s joint replacement program and procedures extend far beyond the hospital’s walls. Michelle shared, “From the moment my doctor and I started discussing surgery, he was able to provide me with information about Beebe’s program. Right from the get-go, my knee replacement was a collaborative effort between my physician’s team and the team at Beebe. The nurses, physical therapists, and case manager on the Orthopaedic Services floor work as a team to help all of their joint replacement patients get home as soon as possible. Michelle shared, “That was my goal and everyone helped to make that happen. I wanted to do as much as I could as soon as I could; it was a great team effort. I arrived for my knee replacement at 8 a.m. in the morning and was home at 2 p.m. the next day. “Once I was home, I was told to expect a visit from Beebe Home Care Services within 24 hours. The next day I met Cindy, my case manager, Marissa, my nurse, and my physical therapists, Eric and Jeff. They explained how everything was going to proceed and we were off to the races. My Home Care Services team was there to work with me every other day. Our goal was to get me to the point where I could get out of the house to do more extensive physical therapy. We achieved our goal very quickly. “The physical therapy group at the Beebe Health Campus on Route 24 near Rehoboth Beach are the people I spent the most time with – eight weeks. Don and Nina did a great job with me. They are absolutely fantastic and I know that I wasn’t always in the mood to be there. I’m just being honest. They were always very patient with me and they didn’t let me get away with anything. I was there to do a job and they were instrumental in getting me back to my day to day responsibilities. They are really wonderful people and they do great work. “My Beebe experience started at the physician’s office and all of my follow up has been through my physician’s office. Beebe coordinates with my physician’s office to make sure that everything runs smoothly. This coordination of care is a very important part of the whole process. Beebe Healthcare received The Joint Commission’s Gold Seal of Approval® for Joint Replacement - Hip, Joint Replacement - Knee, and Spine Surgery. The Gold Seal of Approval® is a symbol of quality that reflects an organization’s commitment to providing safe and effective patient care. Beebe Healthcare is a recipient of the Healthgrades Orthopedic Surgery Excellence Award™ for 10 Years in a Row (2007-2016), and is the only recipient in Delaware and on the Delmarva Peninsula. Michelle and her husband Rick are members of the Beebe Medical Foundation’s 1916 Club. The 1916 Club was started as part of Beebe’s 100th Anniversary Celebration and has grown to over 200 members. Members of the 1916 Club make a gift of $1,916 or more to the Annual Fund to help change and save lives daily at Beebe Healthcare. The total giving of the 1916 Club members is over a half million dollars every year. 1916 Club members will attend an exclusive President’s Dinner at Baywood this fall to be recognized for their leadership support and see a preview of Beebe Healthcare’s new facility designs. The Beebe Medical Foundation invites all leaders in our community to join the 1916 Club. You can learn more about the 1916 Club by going online to www.beebemedicalfoundation.org or contact the Beebe Medical Foundation at (302) 644-2900 or write to foundation@beebehealthcare.org.